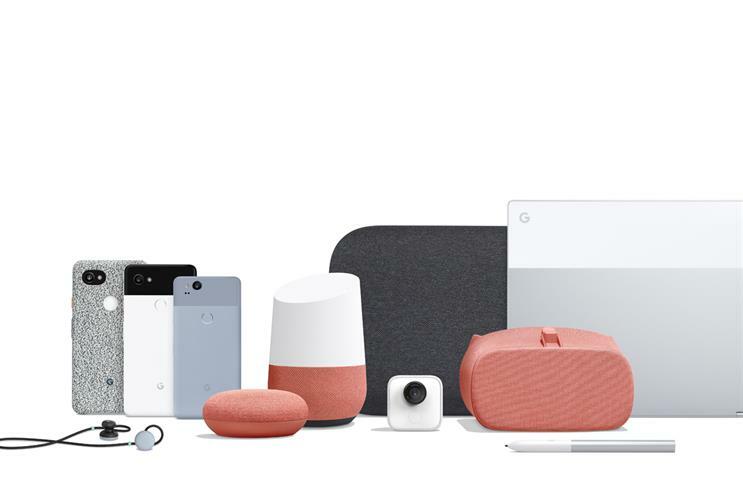 Google has just launched two new Google Home products, two smartphones, smart earphones, a smart pen, a laptop, a new AR device and a camera, all with AI baked in. Google believes that the next big hardware breakthrough does not lie in pure hardware, but in the combination of AI, software and hardware. The new products pose a serious threat to premier hardware manufacturer Apple, to Amazon's voice device lead and it has even pushed out an AR offering that should have Snapchat worried. Addressing the popularity of Amazon's Dot, Google has launched the Google Home mini, a soft, rounded device "as large as a doughnut and lighter than a chipmunk". During the launch event, Google's senior industrial designer even managed to work in a dig at Amazon. "We really thought the design through. It's sleek and smooth no edges. You won't find any black plastic with blinking blue lights," Isabelle Olsson senior industrial designer at Google said. On the other end of the spectrum is Google Home Max, a mega speaker coupled with the capabilities of Google Home. Both come with new updates to Google Home such as Broadcast - which lets you literally broadcast a message to every device in the house, and "Find my phone" which will buzz any Android device and call lost iPhones. Max comes with "AI-based Smart Sound" which has the ability to adapt its audio to the environment, context and preferences. The Google Home Max starts shipping in the US in December and will be in the UK next year. The camera is far and away the lead attribute on the new Pixel 2 and Pixel 2 XL. Google brags that it has the highest rating of any smartphone camera with a DXOMark of 98. Pixel users also get unlimited storage for photos and videos, an exclusive preview of Google Lens, which uses AI to recognise images and provide information, and motion photos – Google's version of Apple's Live Photos. The presentation was littered with subtle slights against Apple. "We don't reserve our best features for the larger device," Mario Queiroz, vice-president and general manager for phones, Google said to cheers. He later added that iCloud users hit their free limit in three months of use and Google Pixel users take twice as many photos as iPhone users. Perhaps the biggest opportunity for brands though comes with the launch of AR stickers, a direct challenge to Snapchat's 3D World Lenses. Launching with the pixel phones are stickers from partnerships with Netflix's Stranger Things, Saturday Night Live, YouTube and NBA. While there are no plans to open this platform up to advertisers, it remains a future possibility, Alex Lee, programme manager for AR/VR and Google, said. Google's new Pixelbook is a direct challenge to Microsoft's Surface, with a flexible keyboard and fully functional touchscreen. The 10mm device weights only 1kg and has Google Assistant built in. Launching with the new Pixelbook is the Pen which, as well as simulating a pen, can be used to circle images and words, as well as immediately search Google using Assistant. The Pixelbook will also work with apps and Snapchat is working on a laptop-sized version of its platform specifically for it. This is a first for the mobile-only platform and interesting considering that Google's AR-stickers rival the social network's 3D World Lens offering. Google's new Pixel Buds (that's what they're calling their new Bluetooth earphones) provide simultaneous translation to the wearer. It translates directly into your ear and then broadcasts a translation of your words via Pixel phone. Google claims that the Pixel Buds provides great digital sound, touch controls and Assistant. Google has also launched a new mobile virtual reality headset and a new camera called Google Clips. Clips uses AI to determine the people that are closest to the user and to capture the best moments (based on lighting, movement and faces). It seamlessly sends clips to the phone, and even edits and curates them. Clips debuts in the US and will eventually be available in the UK and other markets.